Today, at GothamSchools, I had a conversation with my buddy Reality-Based Educator. We were discussing the abysmal reporting that referred to release from the draconian, unattainable, and ultimately absurd terms of NCLB as being "freed." That's far from accurate. It is true, of course, that these states will not be responsible for passing 100% of their students. But, like everything, this comes with a price. In this case, the price includes a junk-science evaluation system, known as value-added, or VAM. This means that when students fail, individual teachers will be held responsible. Naturally, it's the teacher's fault if the student didn't have breakfast, has no electricity at home, or doesn't have a home at all. Why doesn't that teacher use that 40 bucks of Teacher's Choice money to rent apartments for all the kids in need? And how dare they complain of not having a raise in four years when we've just promised them forty bucks? That's enough to almost cover dinner for two at a crappy diner! But I digress. 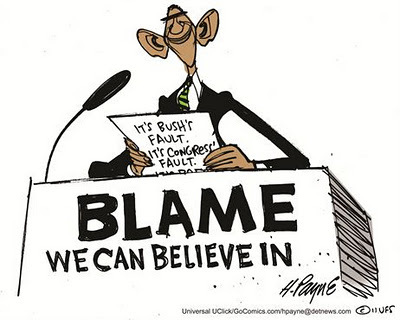 It's important, after a decade of "reform," to blame someone for its utter failure. It's unrealistic for anyone claiming to be "reality-based" to expect politicians to take credit for an entire decade of crocodile tears over education that has borne no substantive improvement whatsoever. So folks like Bloomberg, Gates, and Obama need to pinpoint someone with whom the blame will really stick. Can you play the race card here? You could, but it's no longer as chic as it once was to wear a sheet over your head and burn things on people's lawns. And in the city, the only people riding horses are cops. You can't really strike fear in people's hearts with your head out the window of a Honda Civic. You could do the whole gay-bashing thing, but unfortunately corporate politicians like Bloomberg, Cuomo, and Obama have already gone out and rejected that. This makes them look liberal even as they fail to stand up for middle class and working class people, and they're not about to toss that away anytime soon. So what's left? That's right. Attack the teachers. Their jobs, unattractive to most for decades, look good in this time of recession, and it's pretty easy to tell people that teachers simply have things too good. In fact, Joe Biden had the audacity to get in front of the NEA the other day, and with a straight face told the delegates that Romney was going to go after teachers. Not only did the delegates seem to buy that, ignoring the blatant fact that Obama is already going after us, but lots of them were walking around with Educators for Obama t-shirts. So why shouldn't they go after us? We lap it up like the most pathetic fraternity pledges, with ample, "Thank you sir, may I have another," thrown in for good measure.